My scooter finally arrived yesterday. 3 days delivery time turned into 2 weeks. None of the wing mirrors of anything are on yet as it was dark when i got home last night. It came on a pallet in a big metal cage that took us an hour to dismantle to get it out. But it’s finally here and i can move forward with getting sorted to ride it. 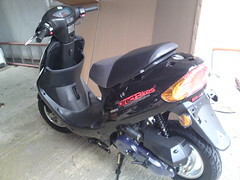 I already have my provisional licence so just need to pass my cbt and get all the paperwork done. Then no more bus for me.